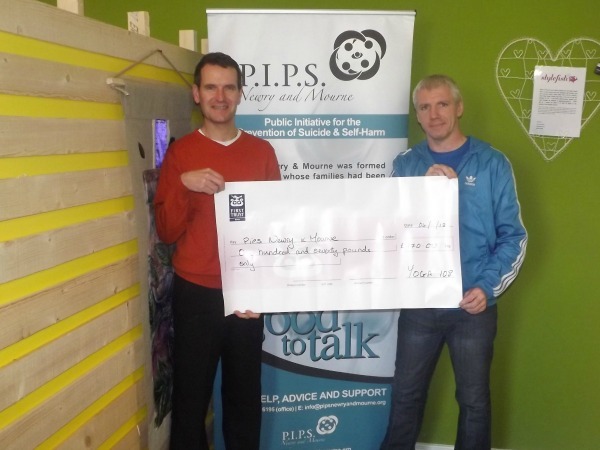 David Johnston (Namaste Yoga Newry) presents a cheque to Kevin Gallagher from PIPS Newry and Mourne for £170. A successful and unique 2 hours of Yoga helped to raise funds for PIPS Newry and Mourne and Women's Aid Newry. David along with his Yoga colleagues, Eddie Kelly, Attracta Brown and Kiera McGroarty, managed to raise £340 and shared this with PIPS Newry and Mourne and Women's Aid Newry. and with the positive feedback, there are plans for another next spring with bigger numbers expected. A huge thank you to everyone who took part in the Yoga 180 event and for their fantastic support for suicide prevention, awareness and support services in Newry & Mourne. David continues to teach Monday 8.15 pm and Thursday nights 8.00pm at Altnaveigh House, Newry.